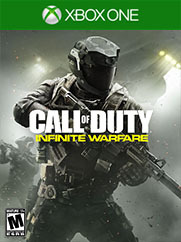 Game Description: Call of Duty®: Infinite Warfare delivers three unique game modes: Campaign, Multiplayer, and Zombies. Campaign is a return to the gritty, military roots of the franchise, while boldly looking ahead, delivering a rich and engaging narrative. Players play as Captain Reyes, a pilot turned Commander, who must lead the remaining coalition forces against a relentless enemy, while trying to overcome the deadly, extreme environments of space. Multiplayer combines a fluid momentum based movement system, player focused map design, deep customization, and a brand new combat system to create an intense gameplay experience where every second counts. Zombies brings a fun, fresh take to Call of Duty zombies. Zombies in Spaceland will transport players back in time to a 1980’s amusement park complete with rides, an arcade, and a functioning rollercoaster. Embrace previously beloved aspects of the mode like easter eggs, power ups, and novel weapons while experiencing innovations like brand-new team mechanics, the After Life Arcade, and Fate and Fortune Cards.